This article celebrates in 2008 the 45 Years of the invention of PAL as well as to give an appriciation to the german television pioneer Prof. Dr. Eng. Walter Bruch, known as „Papa PAL“, Mister PAL or even among us collegues “PAL pal”. "40 Jahre PAL Farbfernsehen" written and enhanced composed by Wolfgang Scheida. Also availiable as MP3 Soundfile as well as an .wmv 70 minutes Video presentation in three parts shortly on request. The 40th anniversary of PAL color television is a major event. The introduction of this color television standard was a milestone for European technical innovation and economic influence – a milestone that television historians want to celebrate one last time. At the time of its inception, PAL required a financial investment of 80 billion € (~120 billion US$) . Let’s go back now to the time when the West German foreign minister and vice chancellor Willy Brandt (the former major of Berlin) symbollicaly pushed the red start button at the International Radio Exhibition on August 25th, 1967 in the western part of divided Berlin. This was the official cerimonial ignition of the German (and most other countries’) color television era. The first steps toward this goal were already taken when a common 625 line television standard was adopted in countries like Great Britain and France. After a long period of dual standards, competing standards were dropped one by one, including their low definition prewar 405 line system as well as their expensive and inefficient high resolution 819 line standard. Both of these old standards were finally gone by the mid 1980s. In many countries, the next step was thought to be the adaptation of the American NTSC color TV standard to European parameters. 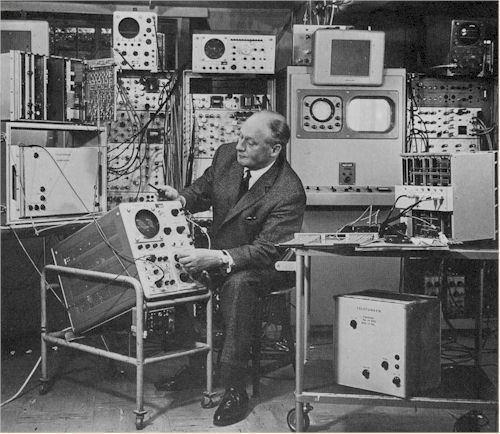 The fact that everything turned out differently was thanks to the innovation, perseverance, and influence of one man – Walter Bruch – (7B) who had been working since 1950 as a leading developement engineer at Telefunken where he started development of the first post-war TV (17B) sets. Who was Walter Bruch -- the Man behind All of This? A Short Biography : Already in 1925 as a schoolboy, Walter Bruch (1908 – 1990) was fascinated by theoretical publications on television (from early pioneers like Korn & Prof. Dieckmann). These publications motivated him to start his own experiments to receive mechanically-scanned television transmissions broadcast from Berlin-Witzleben in 1929. Later he studied electrical technology in Midweida/Sachsen, and earned a degree in mechanical engineering. During the economic depression of the 1930s, his career in Berlin was further influenced by the well-known television work by Denes von Mihaly, Manfred von Ardenne, and by Urtel and Schroeter at Telefunken. 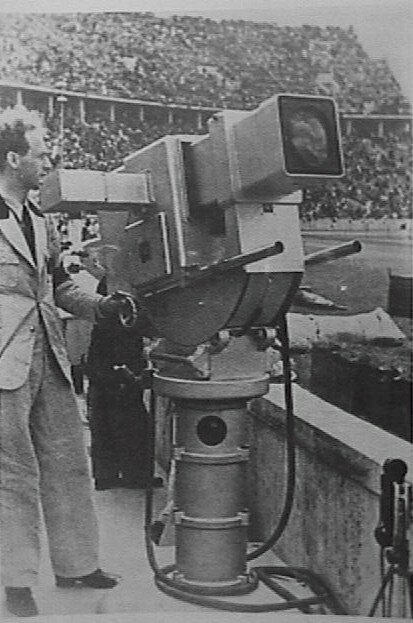 His job assignments included, for example, serving in 1936 as a technician and cameraman for the “television gun” in the Olympic Stadium and for public television demonstrations at the Berlin Radio Exhibition. He served again in this role at the World’s Fair in Paris in 1937. Figure 8: Walter Bruch working for Telefunken at the “television gun” in 1936 inside the Berlin Olympic Stadium during the Olympic Games. Wartime orders led him to construct and maintain a closed-circuit television system at Peenemuende (secret military rocket test site in northern Germany), which was used to control the launch of A4 (V2) rockets. He also worked on TV transmission systems for planes and radar technology using the glass delay line patented by Telefunken in 1940 and used in the “Rehbock” distance control unit. After WWII he worked until the beginning of 1946 under Soviet command in a former research laboratory in Berlin, where he contributed to the development of the 625 line television standard as well as various UHF projects. Later he was once again able to assume a leadership position in television development at Telefunken. Let’s not forget the fact that the key techniques for simultaneous transmission of color with backward compatibility to the existing black and white system were developed in the USA. This development took place in the late 1940s and early 50s. By 1954, after massive investment, the new color system was introduced to the market. This accomplishment was initiated and guided by the RCA at the impulse of its president David Sarnoff, through the use of unusual methods of motivation for his employees and – not to be overlooked -- an investment of 20 billion US$. Previous attempts by CBS to create a serial signal transmission system and a mechanically rotated color wheel (which avoided the difficult task of developing a color CRT) were rejected by the FCC because of incompatibility with the existing black and white standard . At the beginning of 1954, these first steps were completed, and a handful of manufacturers of NTSC color TV sets brought their products to market at subsidized price of 1,000 US$. However, what the customer got for their money was nothing like what we today think of as a color TV. First, the round(!) 15” color CRT was considered as “puny” to the wealthy customers who could buy such a TV. Then there were the color spots due to the earth’s magnetic field, which had to be eliminated during initial setup, and which often returned if the TV was moved. There were also convergence problems with non-coincident color beams on the screen. Last but not least, the end user had to take on the assignment of dealing with adjustments to counter phase shifts occurring in the transmission path. The customer had to use the “tint” and “hue” controls to fix the color if he didn’t want to see red or green colored faces. To simplify adjustment, starting in 1956 NBC inserted the well known peacock test pattern before the beginning of a color transmission to enable the viewer to adjust for proper color. This is how the pejorative nickname for NTSC -- “Never Twice the Same Color” – came about. These “teething” problems – which nonetheless should not detract from the pioneering accomplishments of the 2nd NTSC – and the high cost of sets were the reasons why color TV didn’t really find broad acceptance in the US until the mid 1960s. It should be noted that in 1951, Mr. B.D. Loughlin presented the idea of field-by-field changing of the color field, in order to force the human eye to compensate for phase errors. Due to a disturbing flicker which becomes apparent at high phase errors, this method was rejected by the NTSC committee, and the idea itself got lost as well. In May 1956, the French television expert Henry de France filed a patent , in which both color component signals (now DR & DB) were transmitted sequentially using frequency modulation. To get both signals simoultaneously at the decoder inside of the receiver, a memory is used to cache one component signal for the time of one TV scan line. The fact that this politically motivated system did not find broad acceptance until version “SECAM III b. optimal” shows the variety of weaknesses of the earlier versions of this system had. For example, the early versions had just one frequency for both color components instead of the two frequencies of 4.25 and 4.406 MHz used in the later version. Since SECAM was originally oriented toward the 819 line b/w system used in France at that time (using a 8.37 MHz color subcarrier), and the fact that a suitable delay line to cache a full scan line was not available at a reasonable price, SECAM remained a laboratory curiosity for several years. Even in France, the state-owned TV station showed little interest, and as a result, no one paid much attention to this system outside of France. Walter Bruch kept in mind the assignment his employer Telefunken had given him in 1959  along with a television laboratory – an assignment to evaluate color TV systems. To avoid interfering the then thriving b/w TV market, the laboratory was set up outside of the Telefunken grounds, and PAL was in fact invented in a cellar storage room. He began with neutral comparisons of NTSC and SECAM, with the intention that these investigations would lead to regular color television operation in a couple of years. Walter Bruch reported the superior color stability of the SECAM system to his manager Prof. Werner Nestel. Nestel then immediately invited CSF, the company that owned SECAM, to make an official system presentation in Munich, Germany. Prior to this, there had not been a SECAM demonstration of this magnitude even in France. After this, the SECAM setup was moved to Bruch’s laboratory, where he worked to enhance the system using wireless test transmissions between his company’s lab and his so-called “slipper lab” in his own apartment. These tests showed the disadvantages of the 1st SECAM version, which caused the French to change later to the SECAM 2 version. With his new approach, he would eliminate the NTSC faults by forcing every other line to repeat the previous line’s fault in a reflecting complimentary color. The mathematical sum of both color signals then reproduces the original color. PAL V type delay line.Precision component to create a 63.943µs delay (European PAL 625/50) for the purpose of recognizing matching items. Similar to piezo-electric converters, due to mass production and further miniaturiziation (M-type), it became truly inexpensive to manufacture. The first PAL patent filing took place on July 17, 1961, but was later withdrawn. Only after extended system specifications (for a color television receiver with the color fidelity of the NTSC system) were in place, was a new definitive filing done on Demeber 30, 1962. The outstanding things about his situation was the fact that, although employed by Telefunken, he played a more or less independent role in the development of the new approach. That allowed him in the early times to avoid being taken seriously by the French SECAM competition and therefore he had no opposition. At the end of 1962, Telefunken transferred essential resources into the development of large-scale computers and reduced resources for Walter Bruch’s television development department, which had the responsibility from that time forward to deal with cost reduction for b/w technology as well as development of the future European NTSC color television technology. This was a time when Bruch contemplated leaving Telefunken. 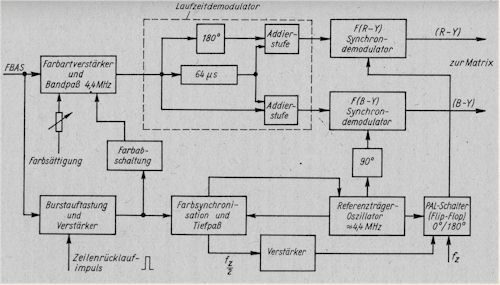 Bruch requested however to be permitted to demonstrate his own innovations like PAL and a modified SECAM (amplitude modulated) as color system improvements on January 3, 1963 to the “ad hoc Gruppe Farbfernsehen” (ad hoc committee for color television), which had just been created by the EBU (European Broadcasting Union), and of which he was a member. In all, six systems and variations were demonstrated. At this time, Walter Bruch naturally gave up his neutral position as only a system tester and became a strong advocate for his own proposed system. As a result, the “Bruch system” was added to the schedule of color systems to be verified at the nearly annual EBU-CCIR conferences. His system received positive recognition in Vienna in 1965 and in Oslo in 1966. The rest of the story has become a living legend as a German patent # DE 1.252.731. System advantages: compatible with the b/w standard, correct reproduction of the chrominance signal in the receiver, directly mixable in the studio, very similar to the NTSC system, high color resolution. System weaknesses (similar to NTSC and SECAM): Until recently, it was difficult at studios to telecast checkered shirts, bar patterns or similar motifs because it resulted in PAL venetian-blind effects / cross color – a colorized glisten of non colored content. Next to nonstatic color edges, faulty interpretation of color information may appear as a luminance signal / cross luminance (chaplet effect); this was one of the few weaknesses that was noticeable to viewers. Theoretically it occurs at high phase errors and low color saturation, which was compensated with automatic amplifier controls inside the receivers since the first generation of PAL TV sets. The simple PAL (“Volks-PAL”) system, which operated without a delay line and relied on the human eye to average out the phase errors. Flickering caused by large phase errors was called “Hannover bars” or “Hannover blinds.” Only one commercial set was built using this system – the Kuba Porta Color CK211P. In actual fact, the name “PAL” was applied to the system just the day prior to the demonstration to the “ad hoc Gruppe Farbfernsehen” (Jan. 3, 1963) as a catchy name was being sought for the system. Naming the system after Bruch himself would not have been an ideal choice, at least for the German-speaking world, since the name sounds something like “breake” or “broke” in German, and no one wanted to use a “broken” system. And so they decided to come up with an English acronym in which an “A” could be surrounded with suitable letters. Finally they came up with the designation PAL which stands for “Phase Alternation Line” . Special translations like “Pay for the Additional Luxury” or “Pay for Another License” were the American payback for previous jabs making fun of NTSC. In contrast to the French, who viewed SECAM as a national achievement (“TV with hi-fi color”) , the Germans promoted their system in a more factual and reserved manner in the face of political hardballon the part of France. The Germans (unlike the French) didn’t have any “Minister of PAL,” offering to license the system at any price, with unfulfillable promises or other special offers included. Just 20 years after the end of WWII, it was not straighforward to recommend adoption of a German system. Success came only after the international technical community became interested in the system, after Bruch traveled personally with his highly prized technical team around the world – from the Carpathian mountains to the Great Wall of China. Sometimes Bruch had to personally take responsibility for shipping Telefunken’s equipment by unconventional means. In his luggage, he had equipment that allowed him to present and compare all three color systems – two at a time side-by-side on a split screen. In order to outclass the latest improvements of his competitors, he continually developed new stress tests to reveal the weaknesses of SECAM. Meanwhile, all three color type of color signals were tested in microwave networks, the first satellites, and terrestrial test transmitters from the Atlantic ocean to the Ural mountains and back again to examine their pros and cons. The building enthusiasm finally overcame even the pragmatic intentions of German politicians, who favored accepting the French SECAM system as a gesture of a new beginning in relations between France and Germany after WWII. * The Soviets exerted their leverage at the CCIR standards conference in Vienna in 1965 and Olso in 1966 to establish a unique European standard by declaring their decision for SECAM one day before the start of the conference. The main reason (among others) for this decision against the PAL system was that the French promised to deliver a ready-made factory for in-line picture tubes (which later became better known as the Sony Trinitron CRT), which could be used instead of the usual RCA shadow mask CRT. This promise was never fulfilled, since the special CRT was not yet ready for mass production. As a result, the whole world – even the eastern block – had to build RCA CRTs under license. This decision created a headache for the eastern block countries – especially East Germany – until CRT imports from the west (and later licensing agreements with Toshiba) allowed normal production. Naturally, all the major broadcasting companies in the world made comparisons among the available color systems, and most of them chose PAL as the technically superior system. In a reversal of previous decisions to go with NTSC, the United Kingdom and the Netherlands, as well as all European nations of the “free world” chose PAL. France and all the eastern block nations, along with all nations in Africa and Asia which were aligned with them and economically dependent on them, were sworn to SECAM. Japan, Cuba, and all countries dependent on exports to the USA adopted NTSC. The rest of the world was divided among special cases like the PAL-N “island solution” for Argentina, based on 625 lines / 50 fields in a 6 MHz channel or Brazil’s PAL-M standard. Other countries joined the PAL standard after their political climates changed, as in the case of China and Yugoslavia after their break with the USSR. The last country on the planet to introduce TV was the kingdom of Bhutan, which first introduced TV in 1999, and naturally chose PAL transmission standard B. We should however not overlook the fact that improvements were also made to the NTSC and SECAM systems over the decades. It would be nice if you could update me on the details of how these improvements work. Nonetheless, almost all eastern European countries switched over to PAL after the fall of the Iron Curtain in 1989, or are now using both systems simultaneously. Great Britain on July 1, 1967 . At first PAL was used only for the less popular 625 line BBC 2 Channel. Color TV became popular when BBC 1 and the commercial ITV stations adopted the 625 line standard. Germany fwas next at the Radio Exhibition on August 25, 1967. Austria (where I am from) started on January 1, 1969 with a broadcast of the New Year’s concert in PAL color. Unlike the first NTSC sets in 1954, color sets in 1967 were based on a more stable technology. In addition, the Europeans were able to start out with the 90° A63-11X CRT and later the A63-120X CRT as the standard screen size; these CRTs were replicas of the RCA shadow mask CRT. Companies like Philips and Kuba-Imperial were able to reduce the enormous development costs by modifying their proven NTSC chassis designs for PAL – designs which had been developed for overseas export markets. At the same time, companies like Telefunken, Blaupunkt, Nordmende, and Siemens used jointly developed and manufactured tube/transistor hybrid chassis. A similar situation occurred among British TV manufacturers, who used a jointly developed all-solid-state chassis (the BRC 2000), and suffered the negative consequences of adopting an all-transistor TV design prematurely. New features that were immediately recognizable to the public included adjustment knobs for “intensity” and “tint.” In addition, most sets had a red/green/blue emblem to indicate the social status of the proud owner. People who were willing and able had to pay the equivalent of €1,200 or $1,800 for basic models. “PAL Color” became a secured trademark displayed on Telefunken color sets only. Other brands added flashy names like (71) “Super-Color” for Grundig, (72) “Spectra-Color” for Nordmende, (73) “Ultra-Color” for Saba, or at a minimum, the word “Color” (70) usually in combination with marketable technical achievements like “Trinitron” or “Qintrix” on the screen mask. Philips (K6 Goya) anticipated the need for this adjustment by automatically switching to a more bluish tone on b/w programs. When the set received the PAL burst for a color telecast, the screen drivers were set to a chamois color. The audible click of the relays switching would trigger some joy of anticipation as the viewer knew that a color program was coming next. PAL decoder with discrete components. On the right edge you can identify the 4.43 MHz reference oscillator; inside the big frame in the middle there are parts of the two synchrous demodulators; in the small frame we find the burst phase comparator. In the studio, it was often necessary to deal with varying white balance and correct lighting. There was also the study of vectorscope figures and the creation of new test patterns, which eventually led to the FubK or Philips test pattern. Proper adjustment of convergence (to align all three colors on the screen) was a real chore for a lot of technicians until the 1980s. 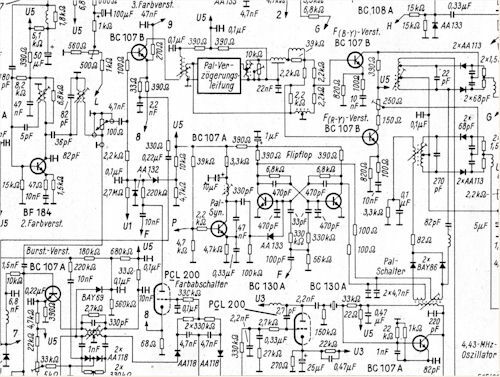 The schematic offered a choice of at least 50(!) trimpots or adjustable inductors for adjusting the convergence – plenty of opportunity to test the knowledge and capability of the technician. 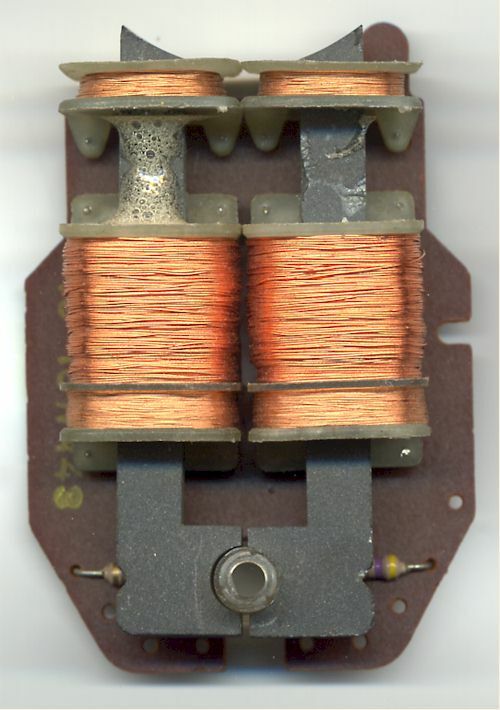 Opinions differed on the question of generating the high voltage for the CRT anode using the horizontal deflection circuit, or whether a twin line transformer concept was better. Furthermore there were questions as to whether to use a low impedance cascade, like that used by Metz, or a high impedance high voltage supply with a shunt regulator, like Philips used. The latter option led to discussion about the maximum tolerable level of X-ray emission from color TVs and their potential health hazard – particularly in the event of failure of the shunt regulator triode. Prior to this those in technical circles got excited about whether existing antennas were color ready or not. In 1970 the magazine “Hobby” lamented the lack of stability in the existing color sets on the German market. This situation improved rapidly as integrated circuits and transistors saw increasing use. Fully transistorized product generations like the Grundig Super Color series or the Philips K9 chassis brought mass market acceptance for color TV in Germany and other countries in the 1970s. By the early1980s the patents for PAL were starting to expirie, and by virtue of the availability of integrated chroma signal decoders, multistandard sets were appearing, like the Grundig Super Color CTI series, which could process both PAL & SECAM signals. In the early 1990s, there was a “nonstarter” called D2MAC – which means digital sound with multiplexed analog component video. This was intended to be the forerunner for a planned standard definition version of the 1250 line analog HDTV system. That system quickly faded into history after its initial debut, with the exception of a lingering usage as a small satellite-only system within Scandinavia that was also later cancelled. In response to the worldwide circulation of VHS tapes and later DVDs, as well as the private exchange of NTSC coded movies, most TVs today are multistandard PAL-SECAM-NTSC compatible sets. On the eve of the forthcoming digital era in 1994, an advanced version PAL called “PAL Plus” was introduced, which was backward compatible with the existing PAL standard. PAL Plus made beneficial use of the black stripes at the top and bottom of 16:9 cinemascope broadcasts, and also included features to cancel cross-color and cross-luminance effects. “Helper” signals transmitted within the black stripes were used to convert signals with just 430 active scan lines into a full-resolution picture with 576 scan lines on 16:9 aspect ratio TV sets. Sets equipped with the PAL Plus decoder were known as “Gold Standard” sets. Due to financial subsidies from the European Union, PAL Plus was indeed used for several years for the transmission of special broadcasts. However, only a small percentage of 16:9 CRT TV sets actually included the decoder. As a result, PAL Plus had nothing more than a shadowy existence. Figure. : PAL Plus logo. PAL Plus was a further improvement of PAL in 1994. 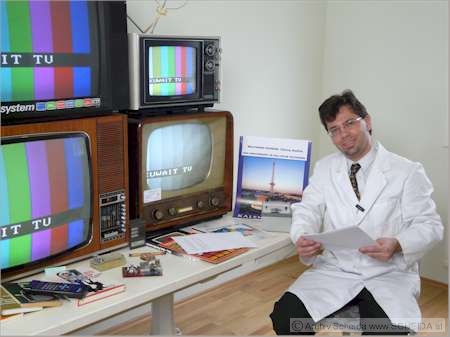 An impressive detailed presentation (also in English) of the first generation PAL and NTSC color televisions is shown by Mr. Etzold on his website. A list of the first generation of PAL sets from all known German manufacturers with their date of introduction is available to download as a pdf file on my homepage. This file includes links to the online museum database www.radiomuseum.org where detailed data has been stored. A list of the first PAL test and alignment equipment can also be found there. Marcel, a Dutch TV collector, has his enourmous collection online. It is ironic that in the years since the introduction of PAL, Telefunken – the company that invented PAL – disappeared from the market after they were bought in the 1980s by the French company Thomson – a former SECAM protagonist. There is further irony in the fact that even as the majority of European and Asian TV viewers benefit on a daily basis from their PAL standard TV pictures, the worldwide transition from analog to digital TV spells the end of this color standard as well as many other TV transmission standards. What we have known as PAL, SECAM, or NTSC is now increasingly known as simply digital RGB or Y, Cr, and Cb color component signals encoded in a DVB (Digital Video Broadcasting) signal or one of its many variants such as DVB-T, DVT-S, DVB-C, DVB-H, or similar ones like your ATSC. In the future, all this may in turn disappear into an abstract IP (Internet Protocol) packet, which would make traditional distribution channels obsolete. For example, major areas in Germany, and all of Austria may terminate their analog transmissions, replacing them with DVB-T or DVB-S only. We will find out whether the 55th anniversary of PAL in 2018 will generate much of a resonance, if all analog TV transmissions – whether terrestrial, satellite, or cable – have been brought to an end. Tonight let’s celebrate the PAL color standard – along with the improved NTSC – and respectfully honor the memory of its creator “Mister PAL” Walter Bruch. "The Telefunken team described three decoding methods for HCPA (sorry, PAL), which they called PAL-S, PAL-D, and PAL-N (the N in this case stands for 'new' and is nothing to do with TV system N used in South America). PAL-S (simple PAL), was the "let them stand back until the Hanover bars aren't noticeable" approach, which couldn't be patented because of the NTSC prior art. PAL-D was the basic delay-line method, and PAL-N or 'Chrominance Lock', was a more sophisticated delay-line method which could track and cancel differential phase distortion, without the loss of colour saturation which occurs with the basic D method. Telefunken patented the delay-line methods, and used these patents vigorously in an attempt to exclude Japanese TV manufacturers from the European marketplace. Consequently, until the PAL patents expired in the mid 1970s, all Japanese TV sets in Europe either used the disgusting PAL-S, or were made by Sony. In the early 1970s, Sony introduced a range of PAL Trinitron TV sets, which had a Hue control like an NTSC set. These were a breath of fresh air in comparison to the dreadful Shadow-Mask TVs of the day, and it was quite a status symbol to own one. The colour decoder contained a delay line. Telefunken sued - and lost. The dreaded Japanese had hit upon a third delay-line method, which was so devilishly simple that only someone whose brain was not saturated with pro-PAL propaganda could see it. Sony used the memoire to store a line so that it could throw away alternate lines and treat the signal as though it was NTSC*. If NTSC was as bad as it was claimed to be, Sony should have been inundated with complaints; but as it was, if you owned a Trinitron set in those days, people came round to your house to watch it with you, and the TV companies adopted the video-monitor versions as studio monitors (despite the EIA tube phosphors - it was the brightness they wanted). The irony was that the most discerning TV owners were watching PAL as NTSC. Sony changed to the PAL-D method when the Telefunken patents expired, and felt obliged to devise a hue control for that, to keep up the tradition. The control didn't do anything useful, it basically gave the user the choice of whether or not to have Hanover bars, and they dropped the idea fairly quickly. 1) The Sony method was known as 'gated NTSC' and came in two versions; PAL-H and PAL-K. PAL-K attempted to ameliorate the diff-phase problem by averaging over several NTSC lines, but it gave pictures in which the colour appeared to be displaced downwards, and (in the author's opinion) the disarmingly simple system-H gave best results. Diff phase was never a problem unless there was bad ghosting on the signal, and it was never a problem with colour video playback either. In practice, with the modification mentioned below, the decoder hue control was set once and never touched again. 2) In order to get as far away from Telefunken's patents as possible, Sony eschewed the 'official' method for extracting colour line identification information (the swinging burst), and instead used an obscure feature of the PAL signal called 'Brüch blanking'. The problem was that Brüch blanking was optional (ish), and some TV stations didn't always use it (it varied from day to day at one point). The Sony decoder didn't actually care whether it used all +(R-Y) lines or all -(R-Y) lines, but a different setting of the hue control was required in each case, and the line ident was required to make the choice consistent. If there was no line-ident, there was a 50% chance that the hue control would have to be readjusted on first locking on to a signal; and the (commercial) stations emitting the non-standard signals also tended to put breaks in the sync-pulse train at programme changeovers, which threw the system out of lock and made the Sony users keep on getting up to adjust the set every few minutes. Modifying the decoder, to use swinging burst ident, involved a little circuit using two diodes and a transistor (a phase-bridge to compare the reference burst against the subcarrier oscillator, and a transistor to reset the PAL flip-flop), which could be tacked on to the underside of the circuit board." 5 PAL Plus logo. PAL Plus was a further improvement of PAL in 1994. 8 Walter Bruch working for Telefunken at the “television gun” in 1936 inside the Berlin Olympic Stadium during the Olympic Games. A illustration of the positive political environment for the introduction of color television in Europe can be found in the study of Mr. Andreas Fickers "Politique de la grandeur" versus "Made in Germany" ISBN 978-3-486-58178-2. A semi professional movie documentary was made by the students of the Mittweida high school who adopted “Papa PAL” in a very touching way. Up to date information can be found here. With proper acknowledgement of my name as source as well as the web address http://www.scheida.at/scheida/televisionen.htm, permission is granted to use and republish the written and spoken content of this documentary. This does not include the right to copy and/or use of any part of the still picture content without the permission by the actual owners of the copyrights. Downscaled into 720 x 480 format i / 29.97 fps with 16:9 aspect ratio / English edition. This article was edited 29.Sep.09 12:08 by Wolfgang Scheida .